Select LCBO stores will begin stocking a new, limited-release beer from Beau’s All Natural Brewing Company this week. The beer is a Dunkel Weizenbock, which is a strong, dark version of a traditional Bavarian wheat beer — the style suits the cooler weather Autumn brings. In addition to selling this new creation direct from the onsite retail store at the brewery, Beau’s is also releasing a few hundred cases to about 25 LCBO stores, where it will sell as a single-serve 600 ml bottle priced at $7.85. “To date, the only way people could buy our Wild Oats beers was to take a trip out to our brewery, so this is super-exciting for us,” says Steve Beauchesne, who co-founded the brewery with his father, Tim, in 2006. “We love the idea that people in different parts of the province will be able to pick this new beer up at their local LCBO store. It’s a game-changer for sure,” he says. 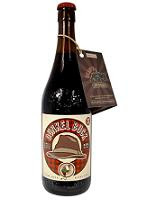 The beer, dubbed “Dunkel Buck,” is part of Beau’s Wild Oats series, which is dedicated to exploring the bold flavours and exciting aromas of challenging styles of beer. The cloudy, unfiltered beer displays intriguing clove and banana aromas. The flavours follow, adding in a chocolate/mocha undercurrent to the mix. The beer finishes dry with a slightly tart spiciness, and the alcohol is moderately warming. It can be pleasantly paired with Weisswurst, smoked salmon and cream cheese, or vanilla ice cream. Beau’s All Natural was asked by the LCBO to create a fall seasonal for this feature release, which will run until October 8 or while supplies last. The promotion is designed to highlight Ontario Craft Brewers members’ best fall seasonal offerings. Look for Dunkel Buck on LCBO shelves this week, shoulder to shoulder with creative offerings from Great Lakes Brewing, Grand River Brewing, and Flying Monkeys Craft Brewery. A complete list of LCBO stores carrying the Dunkel Buck will be available soon online at www.beaus.ca.